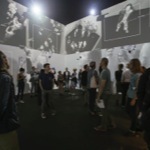 Rafael Lozano-Hemmer - Project "Zoom Pavilion"
Zoom Pavilion is an interactive installation that consists of immersive projection on three walls, fed by 12 computerized surveillance systems trained on the public. 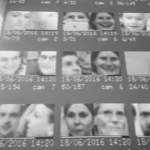 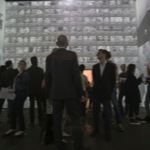 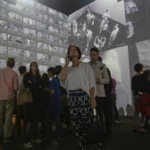 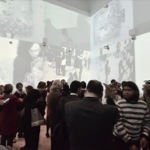 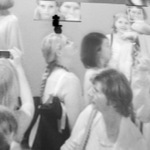 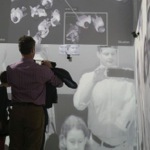 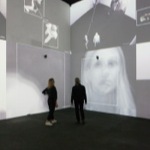 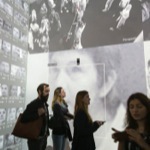 The piece uses face recognition algorithms to detect the presence of participants and record their spatial relationship within the exhibition space. 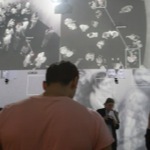 Zoom Pavilion is at once an experimental platform for self-representation and a giant microscope to connect the public to each other and track their assembly. 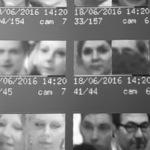 Independent robotic cameras zoom in to amplify the images of the public with up to 35x magnification: the zooming sequences are disorienting as they change the entire image "landscape" from easily recognizable wide shots of the crowd to abstract close-ups. 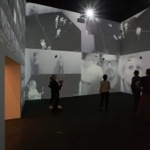 The whole installation is in a fluid state of camera movement, highlighting different participants and creating a constantly changing animation based on optical amplification and tracking. 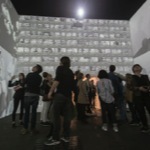 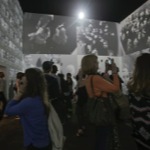 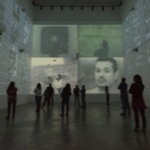 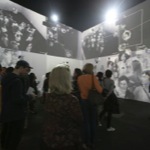 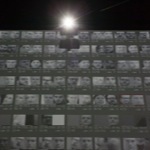 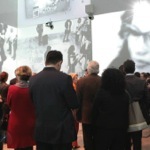 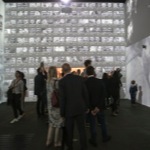 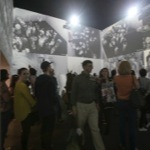 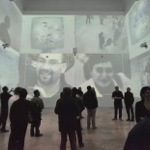 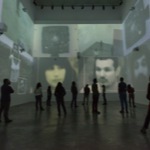 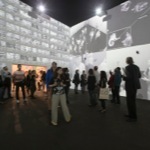 Zoom Pavilion marks the first collaboration between artists Rafael Lozano-Hemmer and Krzysztof Wodiczko. 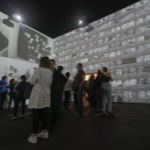 It was originally conceived for the Architecture Biennale in Beijing but only realized for Lozano-Hemmer’s current solo exhibition in Mexico City’s MUAC Museum. 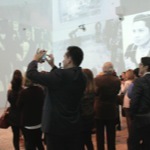 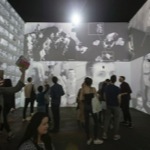 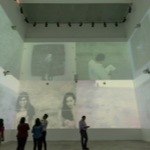 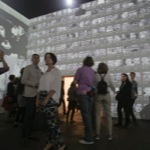 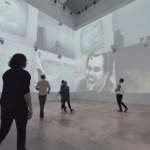 These artists' practice often involves transformation of an existing built environment using projection technologies to "augment" the site with alternative histories, connections or public relationships. 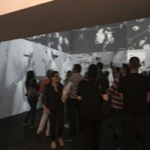 The term "projection mapping" is now used often to describe techniques that Wodiczko was already deploying over 30 years ago. 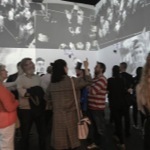 Meanwhile Lozano-Hemmer’s contribution to the field in the past 20 years has been to develop ways to make mapped projections interactive with the general public. 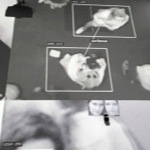 This piece emphasizes the temporary construction of connective space in relation to predatory technologies of detection and control. 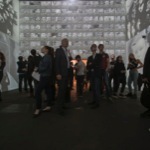 Keywords: database, projection, indoor, recorder, robotic. 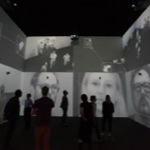 La Tête dans le Nuage, Musée de la Civilisation, Québec, Québec, Canada, 2019. 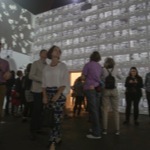 Future Shock, Site Santa Fe, Santa Fe, New Mexico, United States, 2017 - 2018. 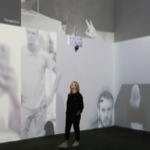 From Selfie to Self-Expression, Saatchi Gallery, London, United Kingdom, 2017. 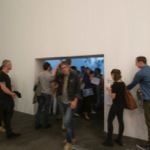 Art Basel Unlimited - Art Basel 47, Art Basel, Basel, Switzerland, 2016.